My functional pottery is hand crafted on the potter's wheel with a warm bodied stoneware clay. 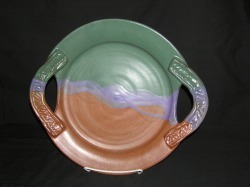 Dinnerware is glazed in my "Mountain Magic" glaze combination, and fired at cone 6. All pieces are dishwasher safe, and can be heated in the microwave or conventional oven. Each hand made piece is unique; sizes are estimated only, and prices are subject to change.